Like we already stated, the architecture of memory chips is organized into blocks, and those blocks are divided into pages. 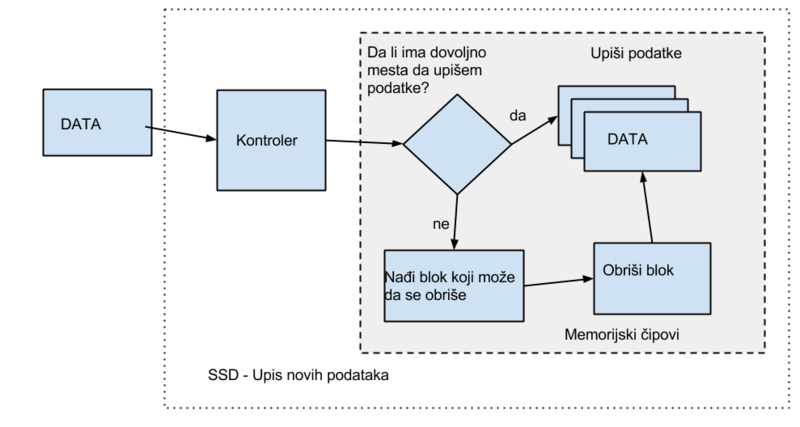 While reading and programming of the chips is page based, erasing operation is on block level. To achieve desired speed and the longer functionality of the SSD, different manufacturers use different and patented algorithms to store data. To simplify, that means that one Word document is not stored linearly, on successive blocks, rather, parts of the documents are stored on multiple chips. Even though this explanation sounds relatively simple, its a fact that there is no industry standard of page organization inside every single NAND block, which is a significant problem for data recovery. The term logical malfunction or damage, refers to a broad specter of situations which lead to data loss, but the media is completely sound. Examples are deleted data, either by accident or on purpose, data corruption by OS, corruption of the written data due to error in firmware, or malicious software, etc. In all those situation, data recovery is always done on media clone, which is made by a special piece of equipment, so as to preserve original data integrity. The OS used on that computer does not represent any difficulty to data extraction. A special class of problems during data recovery are leftover pages inside memory cells. Those are the pages which are not actual anymore, but were not picked up by garbage collection up to that moment. Actual versions of those pages is stored in some other blocks, not necessarily on the same chip. All those things are important parts of SSD design so it can achieve the speed they are known for. When you delete something on your SSD, OS does not go through SSD and wipes data. He uses special functions, like TRIM command, to mark the data you want deleted as old or invalid. The actual deletion is done when you want to write some data on your SSD. To actually write something in some location, that location must first be wiped clean, and as we already mentioned, that means the whole block must be erased. If that block is not empty , meaning if the some of the pages inside that block aren’t marked as “old” by TRIM command, then those pages must be transferred to other locations, to empty the whole block for wiping. For that reason, and taking into consideration the limited number of writes to cells, there is a need for garbage collection, as well as uniform distribution of writing data. During the manual data reconstruction, we come across those invalid data pages, with the end result of damaged data, which must be rectified. Using our years of experience with SSD, we have the knowledge to make the best result for the client.